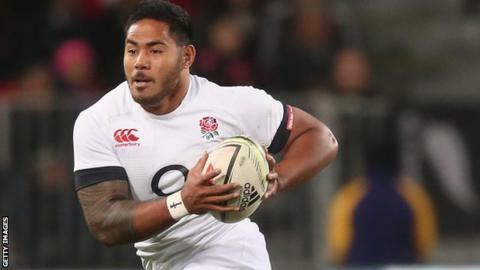 Manu Tuilagi is a doubt for England's Six Nations campaign after saying his recovery from a groin injury is progressing slowly. The Leicester centre, 23, has been out since October with the problem and missed England's autumn internationals. England start their Six Nations campaign against Wales on 6 February, and name their squad on Wednesday. "It's slow but it's getting there. No one's really sure how long it's going to take," said Tuilagi. "When it first happened even the doctor said it would be six to eight weeks." Tuilagi suffered a recurrence of the injury in Leicester's European Champions Cup win over Ulster on 18 October. He says he is taking his rehabilitation "day-by-day" and needs to make sure he is fully recovered before returning, suggesting that may not be until the end of February. That would rule him out of at least England's first three matches, possibly more. "I have to get this right," he told national newspapers. "It's not like a sprained ankle where you can strap up and get on with it. I have to make sure that, if I need to take another week or two, I'll take it." England are hosting the World Cup, which starts in September, and Tuilagi said: "The World Cup is in the back of your mind. "But for me I'm not worried about anything else but trying to get fit and then playing for Leicester and hopefully for England."